The beach incentive trip is hosted on the Black Sea coast in Bulgaria. The location offers white sandy beaches, sand dunes and facilities for beach activities. The available activities include beach volley, frizbee, beach football, horse riding, cycling, canyoning, walking in nature and a journey on a riverboat. For entertainment we can alternate evenings between a private DJ party on a boat and a traditional Bulgarian evening with folk singers and dancers as well as fire walkers whilst enjoying some home-made rakia, degustation of wine and slow-cooked meat from a spit-roast with many traditional Bulgarian side-dishes. 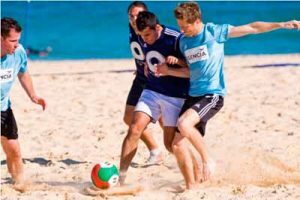 JMB Travel can organise a tailor-made beach team building event for your company where you choose the activities and entertainment options. It is a great way for your employees to enjoy a fun time together outside the office with their feet in the sand and heads in the sun. Our aim is to create a bespoke beach team building event that is fun and memorable. We will tailor the incentive trip to reflect your company’s objectives and the personal preferences of the group. You can choose the activities that best suit your team. Entertainment such as traditional Bulgarian evening and private DJ party. As part of the active teambuilding event or as an additional benefit JMB Travel offers exciting corporate travel rewards.